2-1441 - Turbonetics/Spearco Water Pump - Dezod Motorsports Inc - Home of the automotive performance enthusiast since 2002. Turbonetic/Spearco’s new water pump features all the latest technology in water pump design. New lightweight ABS body construction coupled with the new magnetic drive system offers you superb flow capacity for all your intercooling needs. The hose barbs are now incorporated as part of the ABS body design eliminating additional barb fittings. This new unit operates quieter, cooler and draws less amperage as compared to its previous counterpart, without sacrificing flow. 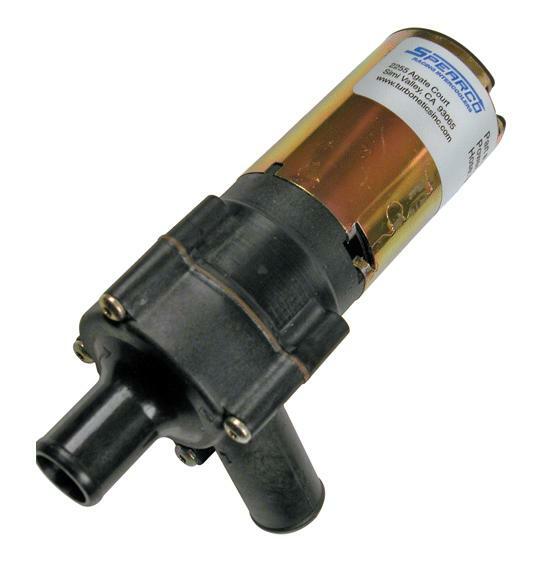 The Turbonetics/Spearco Water Pump produces an estimated 6 to 8-GPM at the waterside head pressure.